I love writing notes, letters, and cards to my nieces. I got the idea from when I was a kid and would get cards from my faraway aunts for every single holiday. Well, thankfully, most of my young family members live in my town and I see them for many holidays and their birthdays. But what about cards just because? I have done that too. I have two nieces (sisters, ages almost-10 and almost-8) who have expressed great appreciation for my cards. Especially the 9 year old, but for this gift I decided to include both girls. 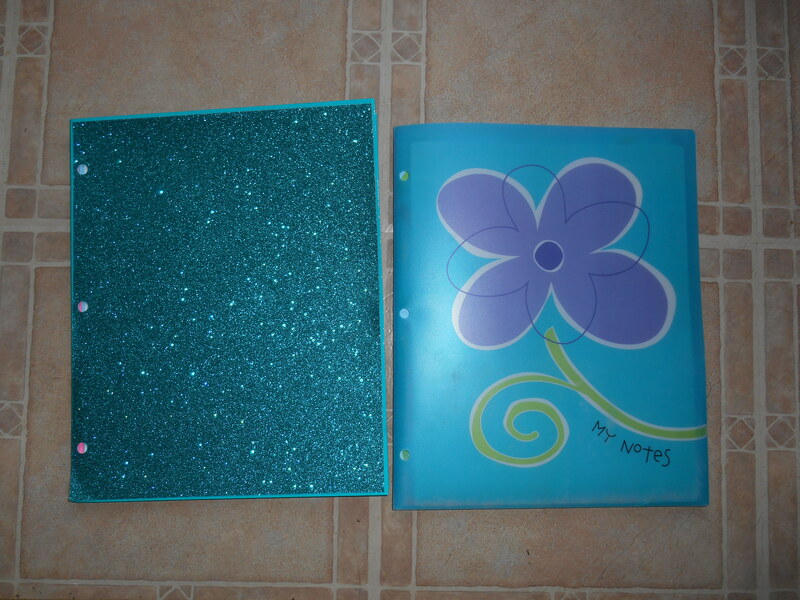 I started with two gorgeous folders I received from a teacher friend getting rid of them. The sparkly one is the 9-year-old’s, and the flower one is for the 7-year-old. Inside I included tons of paper. I have a ton, and I needed to spread the wealth, you know? 10 sheets of pink, 10 sheets of blue, and 10 sheets of fish stationary. The pink and blue are from the reams of each we bought to print our wedding programs on. We have so much left. The fish stationary was a Christmas gift to me from when I was still a minor living with my mom. I have used a bunch… still have a bunch left. 5 sheets of each decorative paper. Two pieces of pig stationary. I didn’t have much of this. It’s from my childhood. A sample envelope (on a big notecard). On one side, there’s a generic form. On the back, there’s an example with their REAL name and address in the top left corner, and my real address in the mail-to section. I thought it might be easier that way, too. Of course I drew where the stamp should go. Their very own address book! Really just some papers stapled together more than a book. I included everyone’s addresses that I had that would be of interest to them. Including: their grandmas on both sides, their grandpa and nana on our side, all of their aunts and uncles on our side (mine is first, hehe), their dad, their half-sisters, and their great-grandma on our side. Their own address is at the top of each girl’s address book. I know they have more family, so I included a heart-shaped post-it note reading “Please add your own! I don’t have your whole family’s addresses!” and left lots of paper for however long they choose to keep this stuff. The only thing missing is envelopes and stamps. I am thinking of buying a book of stamps and tearing it in half so each girl gets her own, and I’m not going broke for something that may never get used. I originally included a couple of cards I’d love to get rid of, but I realized that the envelope is square, and that requires extra postage. Rather than trying to explain that to the girls AND making their mom buy more stamps, I removed the cards. Here’s the inside of one kit. I made these because they like getting cards from me, so I thought they might want to send some mail themselves. I hope to receive some of that mail! It would be a blast to get one of these pieces of stationary back with their name on the envelope. I’m also trying to encourage writing habits. The more you read and write, the better reader and writer you become. That’s important to me. This entry was posted in How-To and tagged cards, family, gift, stationary. Bookmark the permalink. ← Oil Pulling (Day 2): Too Much Oil! Thank you do much! I am participating in a fundraiser called endure 4 kindness where participants do something for as long as they can in a 24 hour period. I decided I wanted to craft stationary kits for children to be given away to encourage letter writing amongst children. I looked everywhere for ideas and stumbled across your blog. The local elementary school runs a school post office for students to teach letter writing skills. So it will now be my goal to make one for each student!